Wolf Commercial Real Estate, the leading Moorestown commercial real estate brokerage firm that specializes in Moorestown commercial real estate listings and services, is now offering premier Moorestown office space for sale or lease in downtown Moorestown at 702 East Main Street Moorestown NJ. This Moorestown professional office space for sale or lease is housed in a three-story Moorestown office building for sale or lease. This Moorestown professional office building for sale or lease is a stand-along professional office building. The asking sale price for this professional office space in Moorestown is $899,000, while the asking lease price has been set at $20.00 sf plus electric. This Moorestown professional office space for sale or lease is being offered for immediate occupancy through Wolf Commercial Real Estate, a Moorestown commercial real estate broker with expertise in Moorestown commercial real estate listings and services. This Moorestown office building for sale or lease in downtown Moorestown at 702 East Main Street Moorestown NJ features +/- 6,800 square feet of professional office space in Moorestown. 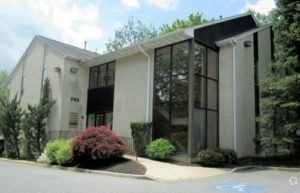 This Moorestown professional office building for sale or lease also has elevator access to all floors. The lower-level space of this professional office space in Moorestown is raw and awaiting renovation while the first floor of this Moorestown professional office space for sale or lease is fit out as office professional. Prospective tenants will find that the second floor of this Moorestown office space for sale or lease is currently fit out for medical usage. Located in the township’s business district, this Moorestown professional office space for sale or lease is located off Route 295 and Route 38 with easy access to the New Jersey Turnpike. In addition, this Moorestown office building for sale or lease in downtown Moorestown at 702 East Main Street Moorestown NJ is within walking distance to Virtua Women’s Primary Care and Wellness. Parking is ample at this Moorestown office space for sale or lease and both street pylon and building signage are provided to tenants at this Moorestown professional office building for sale or lease through Wolf Commercial Real Estate, a Moorestown commercial real estate brokerage firm with expertise in Moorestown commercial real estate listings and services. For more information about this Moorestown office space for sale or lease in downtown Moorestown at 702 East Main Street Moorestown NJ or about any other Moorestown commercial properties for sale or lease, please contact Christopher R. Henderson (856-857-6337; chris.henderson@wolfcre.com) or Jason Wolf (856-857-6301; jason.wolf@wolfcre.com) at Wolf Commercial Real Estate, a Moorestown commercial real estate broker that specializes in Moorestown commercial real estate listings and services. Wolf Commercial Real Estate is the foremost Moorestown commercial real estate broker that provides a full range of Moorestown commercial real estate listings and services, marketing commercial offices, medical properties, industrial properties, land properties, retail buildings and other Moorestown commercial properties for buyers, tenants, investors and sellers. Please visit our websites for a full listing of Moorestown commercial properties for lease or sale through our Moorestown commercial real estate brokerage firm.